It features new 3D mobile surveillance radars and 12 missile launchers for quicker reaction. NASAMS-II is highly adaptable mid-range solution for any operational air defence requirement. India is deploying multi-tiered air defence network to fully secure its airspace from incoming fighter aircraft, missiles and unmanned aerial vehicles (UAV). Phase-I of indigenous BMD is expected to be deployed soon. The US Congress in March 2018 had voted to renew GSP through 2020. 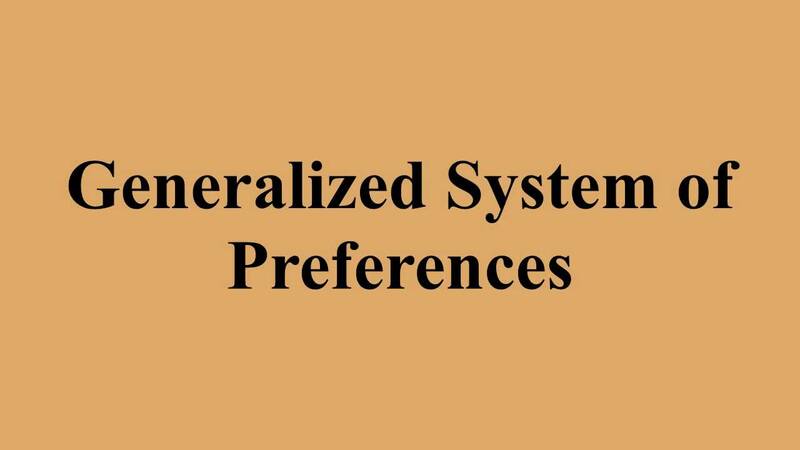 After the withdrawal of the Generalised System of Preferences number of goods qualifying for preferential treatment could be reduced, or the whole programme could be withdrawn. India and US have established new two-by-two (2 by 2) ministerial dialogue to enhance strategic coordination between them and maintaining peace and stability in the Indo-Pacific region. The new dialogue format will replace the earlier India-US Strategic and Commercial Dialogue. It will be similar to the India-Japan 2+2 dialogue format between foreign and defence secretaries of the two countries. India and US had elevated their Strategic Dialogue in 2009 which mainly focuses on regional security, economic cooperation, defence, trade and climate challenges. The purpose of two-by-two ministerial dialogue is to put strategic, defence and security relationship between the two countries at the forefront and centre stage. The new format would include External Affairs Minister and Defence Minister from India and their American counterparts Secretary of State and Defence Secretary. The new ministerial dialogue would enhance strategic coordination between the two nations. It will be helpful to coordinate more closely on Afghanistan, developments in the Asia Pacific, Indian Ocean and also in the Middle East (West Asia). It will insulate the India-US strategic relationship from feuds over trade and deep divide on economic integration policies as trade and commercial issues were discussed in the Strategic and Commercial Dialogue earlier. 2+2 dialogue held in New Delhi in Sep, 2018. India signed COMCASA. UAV Technology sale to India approved. The transfer of the state-of-the-art UAV technology to India will be the first significant progress after India’s entry into the exclusive Missile Technology Control Regime (MTCR) and after the US has designated India as a major defence partner. 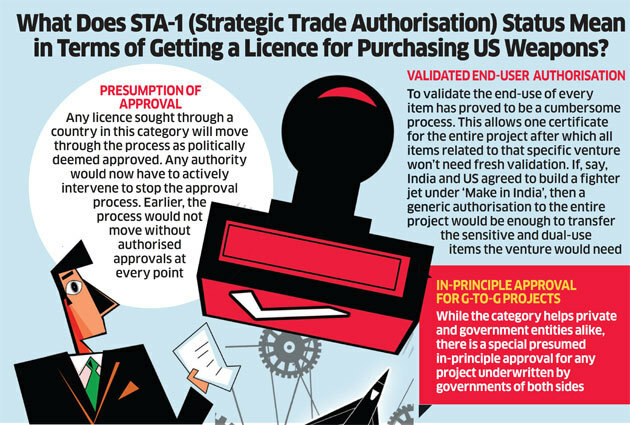 United States (US) has made changes in its export control laws that will benefit India by facilitating smoother transfer of technologies and arms. These changes have been made in par with recognition of India’s status as a ‘Major Defence Partner’. The new rule creates a presumption of approval for Indian firms seeking to import the Commerce Department-controlled military items, except weapons of mass destruction-related goods. Henceforth, companies will not need a license at all after becoming a Validated End User (VEU). Under it, India will be denied licences only in the rarest circumstances. 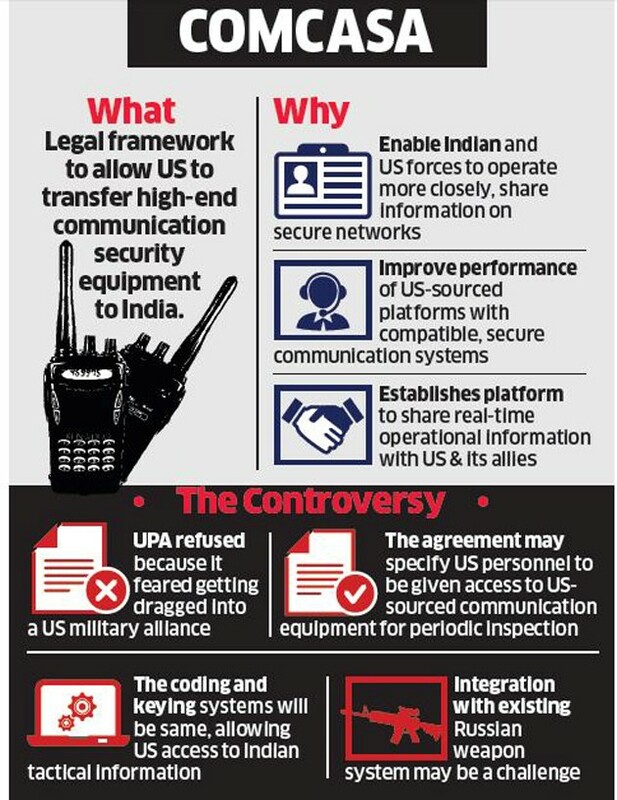 While traditionally, India and the United States have not had very close co-operation in High Technology areas that has been changing in the recent past. 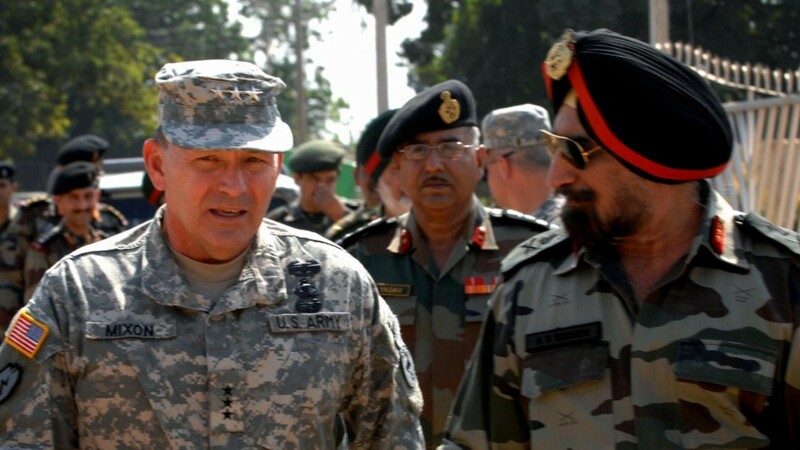 India and the US are collaborating in a range of areas, out of which Defense is a major area of cooperation. Defense Framework Agreement – A 10 year Framework Agreement on defense was first signed between the two countries in 1995 and renewed in 2005 and 2015. All defense co-operation between the two take place within that Framework. Bilateral Exercises and Joint Training – The two countries now participate in more military exercise with each other than with any other. Malabar is an annual bilateral exercise between the Navies of the two countries. India accepted an invite to participate in RIMPAC (rim of pacific)- a US organised naval exercise. The forces of both the countries regularly train at defense training establishments of each other. Institutional Mechanisms – There are many institutional mechanisms to promote defense co-operation between the two. There is a Defense Policy group, a Defense Procurement and Production Group and a Defense Joint Working Group. This is in addition to the direct Service to Service Executive Steering Group. Information sharing for counter terrorism operations is highlight of the relations. However, the legacy of Non Alignment along with other strategic reasons is causing a hindrance in closer co-operation in strategic areas like defense manufacturing. While India is the largest democracy, the US is the oldest one and both countries share common ideals and common vision. It is thus imperative that they take a holistic view of their relationship and develop even closer ties. U.S.-India Defence Technology and Partnership Act in US Congress which would institutionalize Defence Technology and Trade Initiative (DTTI) framework between India and US. Ongoing debate regarding signing of agreements like logistics support agreement (LSA) which will allow use of Indian bases for logistic purposes and vice versa, and likewise Basic Exchange and cooperation agreement (BECA). These all are signs of increasing defence and strategic partnership between the two. These developments certainly benefit India’s defence capabilities and defence Industrial complex but one cannot discard the inclination of US towards India in wake of more assertive communist China and power shift from the west to the east. India’s lack of defence Infrastructure in the wake of expansionist china cannot be balanced with such partnerships in long run until unless India has a full-fledged and sustainable defence industrial complex. One lesson that India can learn from its over-dependence on Russian defence infrastructure for several decades in last century. Such partnership might get involved India in geopolitical problems which are not of its own making. India should play a role to diffuse global conflict rather than escalating the tensions. US’s role towards Pakistan is not clear, its support of Pakistan both economically and through the supply of defence equipment has led to an upsurge in India’s defence expenditure as well. Such situation has not led the subcontinent to get rid of actual problems like health, illiteracy and poverty. India should tread on this path very carefully and not let in any way compromise it stand in the global domain. India would not be able to stress its role in international arena until and unless it is viewed as an independent power rather than walking crutches from US or any other world power for that matter of fact. Should India be cautious of over indulging with USA? An informal military alliance with Washington and possible request for participation in armed conflict. Possible embargo of weapons and ammunition to India in case of a conflict of interest. Possible loss of sovereignty of India’s foreign policy. Possible strain in Indo-Russia and Indo-Chinese ties due to this growing partnership. India has a diverse base of weapons suppliers including Russia and Israel. None of these treaties include basing rights or rights to use Indian assets by the USA anywhere in the world. Countries like Germany and France(in Libya) and Turkey (in Iraq) have successfully opposed the USA with respect to international issues though they are all crucial allies of the USA. Therefore, though these agreements do not mean an alliance of any sort, India must take care to ensure that it is not perceived so by either her allies or her enemies. What is important is the realization that the Indo-US closeness is just one among many handshakes of India in her quest to build stable international relations.